The Pacific Sailfish is prized by anglers. Its coloration and vigorous fighting makes this a true trophy. The Pacific Sailfish or Indo-Pacific Sailfish (Istiophorus platypterus) has a different coloration and is also much larger than the Atlantic Sailfish. The Pacific Sailfish with its large dorsal fin is a sought after prize trophy. 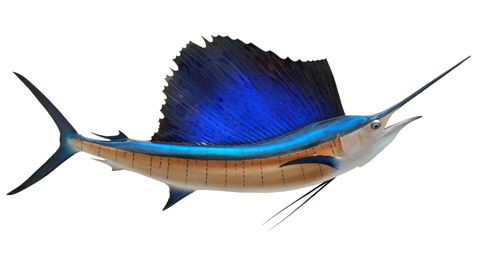 The blue colorations with the many hues of gold and its size make the Pacific Sailfish a formidable foe and a trophy for any angler and avid fisherman. They are found near the ocean surface usually far from land feeding on schools of smaller fish like sardines and anchovies, which they often shepherd with their sails, making them easy prey. They also feast on squid and octopus. The Pacific Sailfish meat is fairly hard and not widely eaten, but they are prized as game fish. When hooked, these commanding, aerodynamic creatures will fight vigorously, leaping and diving repeatedly, and sometimes taking hours to land. The male and female swim as pairs as spawning takes place. She produces a large number of eggs that generate into tiny larvae. The larvae develop sail-like dorsal fins and elongated bills when they are less than 6 inches in length. Sailfish are fairly copious throughout their range, and their population is considered stable. The Pacific Sailfish are currently under no special status or protections. Along with the Atlantic Sailfish they are the fastest fish in the ocean and have been clocked leaping out of the water at more than 68 mi (110 km) per hour. The Indo-Pacific Sailfish normally weighs 120 to 220 lbs (54.4 to 100 kg) and grows to about 5.7 to 11 ft (1.7 to 3.4 m). In the wild, their average lifespan is about 4 years.